First Oxford Properities showed its hand with a series of images depicting a revamped Metro Toronto Convention Centre at the heart of a $3-billion casino proposal, now American gambling giant Caesars has followed suit with its own ideas for what a gaming facility on the site could look like. Decidedly understated compared to the giant residential towers and sprawling park proposed by Oxford Properties, the renderings show a relatively low-key entrance to the facility on Front Street near the Rogers Centre and a concept for an urban park and performance space in the surrounding area. That said, several towers loom semi-transparently in the background without a mention in the accompanying press release. The company also hints at its agreements with musical acts such as Celine Dion, Elton John, Shania Twain, and Rod Stewart, possible visitors to the "year-round" outdoor venue perhaps. Dion's name is shown in bright lights on stage at the "Colosseum" while a modest crowd looks on from the lawn. I'm not sure it would be the same story in the dead of winter mind you. Caesars hasn't officially locked onto the convention centre as its preferred location but these images give some idea as to what the company is thinking. Perhaps the small-scale complex is designed to work in contrast to other grander proposals. Retail and dining outlets on the site are also included in the drawings on the edge of the performance space. Recently, Rob Ford said he would prefer a downtown casino to be on city land (which the Convention Centre isn't) and hinted he'd like to see $100-million in revenue for Toronto and between 10 and 20 thousand new jobs. What do you think of these latest images? Do you think this proposal is better than the one detailed by Oxford Properties? 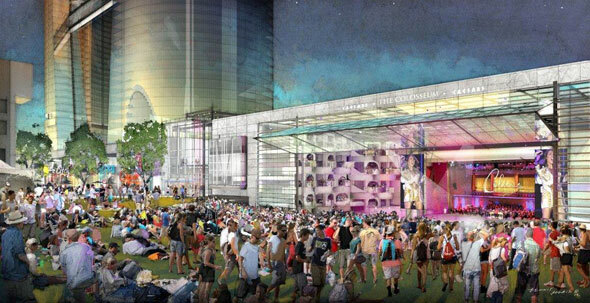 Is an outdoor performance venue what downtown needs?